As any reader of my blog knows, I like to play games. I’ve played a few recently. The Dungeons & Dragons (4th Edition) campaign I’m in here in Cheonan reached a major milestone last night with the killing of a big evil dragon (although this happened in a cave rather than a dungeon). The campaign has been fun – surprisingly so given the large group of people taking part: seven players plus the gamemaster. My previous experience with such a large group is the session becomes noisy and unfocused, but no one in our group has an especially dominating personality, so everyone gets a chance to say and do what they want. Which isn’t to say, of course, that the group is relentlessly focused on the game – there’s a lot of joking and chat, too – which is an essential part of the fun. After a summer break, it looks like a couple of our players won’t be coming back to the game and our characters are all jumping up a few levels. Having already killed a dragon at quite a low level, I wonder what challenges lie ahead for the party. In the last couple of months or so I’ve been working on a couple of games – one is a board game, one a card game. 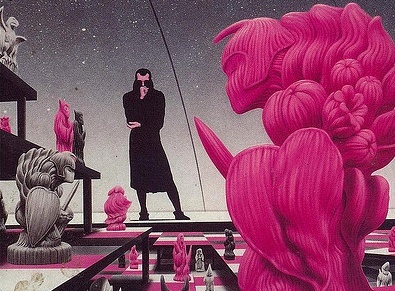 The card game has an urban fantasy setting and a range of characters including vampires, sorcerers, hackers, drug dealers, corporate lawyers and so on. It’s still a work in progress, though; the games I’ve played with it so far show that my intended win condition is not at all easy to achieve. The board game is much more polished. I’ve called it Islands of the Azure Sea and it’s a fantasy piracy game where you move a ship around a sea filled with islands, gathering treasure and items, fighting other ships (including those of the other players), native islanders and monsters. I’ve put a fair amount of work into making the board, the ships, writing out all the cards and changing them several times to balance out the gameplay. I’m pretty proud of it. I’ve played it a few times with friends and students and it’s always been quite fun, but the treasure maps – which are essential to the mechanics and flavour of the game – have generally proved difficult to come by. Introducing a few cards to facilitate treasure-finding seems to have help, though. I played the game on Saturday with some friends down in Daegu, and they really got into the game, making characters for themselves and concocting narratives. Peter, for instance, kept avoiding taking potentially dangerous Sea Cards and adopted the personality No Risk Pete. When he lost a crewman due to a madness card, he said the man had abandoned ship due to boredom; when he subsequently gained a crewman due to a castaway card, he said the man had changed his mind. 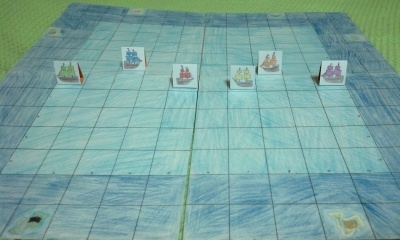 The game on Saturday was part of Peter’s Daegu Gamefest. A pretty modest event, really, but a good opportunity to meet a few new people and play lots of games. When I arrived at the café, Peter and a few others were already playing Munchkin. 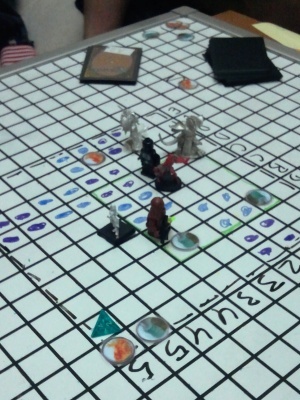 I joined in for a few turns and then we turned to Dungeon Crawl Classics, a simplified roleplaying game where we each had three very weak villager characters – many of whom died. After lunch, a few of us played Islands of the Azure Sea and the rest played Smallworld – which I’d played and really enjoyed the last time or two I was in Daegu. While the other were finishing that, three of us played Space Hulk: Death Angel. Then we all played Betrayal at House on the Hill – in which we were eaten by tentacles. Later in the evening, we played Dogs in the Vineyard, a game about Mormon gunslingers fighting the supernatural. The following day, Peter and I tested my card game. It was a fun, action-packed weekend; I had to hurry from Daegu back to Cheonan in time for the climactic D&D session – and mini-party beforehand. A few weeks earlier, Peter had joined me and a few others for my own gaming day in Cheonan. 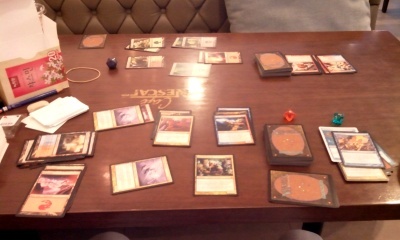 Peter and I played Magic: The Gathering. One of the guys from roleplaying and his wife came and we played Islands of the Azure Sea and Settlers of Catan. Peter left and was replaced by Eve from roleplaying and we played an interesting card game called Dominion. Slightly embarrassingly but undeniably pleasingly, I won all the games (although we decided to cut Islands short). Dominion, Settlers of Catan and Smallworld are all games I would like to play more. The two roleplaying game systems we tried out both seemed interesting and worth trying again – but with RPGs, you really need a lot of time to get to know them. As D&D in Cheonan is on hiatus until September, I think I’ll try to organise another gaming afternoon here – and probably in Seoul, too.